Background: Vancomycin-resistant enterococci (VRE) are on the rise globally in primary intraradicular infections and resistant to most intracanal irrigants and medicaments. The aim of this study was to evaluate the efficacy of irrigants and identify a cost-effective regimen to eradicate VRE. Materials and Methods: In this in vitro study irrigants were categorized as primary and surfactant groups with individual concentrations consisting of 10 samples each. Primary irrigants; sodium hypochlorite (NaOCl), chlorhexidine (CHX), and iodine potassium iodide (IKI) were prepared in concentrations of 5%, 2.5%, 2%, and 1%. Surfactants cetrimide (CTR) and sodium dodecyl sulfate (SDS) were prepared in concentrations of 0.25%, 0.5%, 1%, and 2%. Biopure MTAD was chosen as the control group. ATCC 51299 (VRE) was evaluated for antimicrobial susceptibility to the above irrigants by direct contact test for 5 min. The effect of each test irrigant was determined by calculating the percentage kill of viable bacteria by spectrophotometer. Statistical analysis was done by means of a one-way ANOVA and Mann–Whitney U-test (P < 0.05 consider significant). Results: About 2.5% and 5% CHX were significant over mixture of tetracycline, acid and detergent (MTAD) (P < 0.05). 5% CHX could achieve 100% elimination while 2.5% CHX and 5% IKI had 99.90%. 2% CHX and 2.5% IKI had 99% effective kill percentage. All concentrations of NaOCl were ineffective (90%) as compared to MTAD (95%). CTR (0.5%, 1% and 2%) and SDS (2%) were significant (P < 0.05) over MTAD. Combination surfactant regimens of 2% CHX +0.5% CTR and 2% CHX +1% SDS achieved 99.90% eradication potential and were significant (P < 0.05) over MTAD. Conclusion: Surfactant regimens were highly effective and superior to MTAD. CTR and SDS by their organic solvent property enhanced the antibacterial action of CHX. Enterococcus faecalis is a Gram-positive, Group D Streptococci, and facultative anaerobic bacteria that can survive extreme environmental conditions. They have a number of virulence factors that permit adherence to host cells and extracellular matrix, facilitate tissue invasion, effect immunomodulation, and cause toxin-mediated damage. E. faecalis has been implicated in persistent root canal infection and more recently has been identified as the species most commonly recovered from root canals of teeth with posttreatment disease and hence gained attention in endodontic literature. Recent studies have implicated that Enterococcus species have become multidrug resistant including vancomycin and hence termed as vancomycin-resistant enterococci (VRE). Clinical isolates of VRE isolated from primary and failed root canal cases have caused alarming concerns due to their resistance to most intracanal irrigants and medicaments. Globally, the prevalence of VRE is on the rise due to indiscriminate use of antibiotics both systemically and locally. Sodium hypochlorite (NaOCl) and chlorhexidine (CHX) irrigants have certain limitations despite their routine application in endodontics. Although only higher concentrations of NaOCl have been reported to be effective against E. faecalis, resistance against the same has been reported. CHX, on the contrary, has been used as an adjunct irrigant only; thus questioning the endodontic disinfection protocol. Ethylenediamine tetraacetic acid (EDTA) has limited or no antimicrobial activity and is used in combination with NaOCl. Iodine potassium iodide (IKI) being a potent irrigant has limited application in clinical endodontics. Numerous commercial irrigants are being marketed with modifiers/surfactants and claim to have superior antimicrobial efficacy than their conventional counterparts. Biopure MTAD (Tulsa, Dentsply) contains 3% doxycycline (tetracycline isomer) 150 mg/5 ml, 4.25% citric acid, 0.5% polysorbate 80 (surfactant). Although most studies have claimed MTAD being superior to NaOCl/EDTA regimen and CHX, controversial reports claim no such difference exists. Although clinical isolates have shown resistance to tetracycline, limited data exist on the antimicrobial efficacy of MTAD on VRE. Surfactants sodium dodecyl sulfate (SDS) and cetrimide (CTR) are surface active agents that enhance the wetting ability of the irrigants by reducing the surface tension, thereby promoting their close contact with the microorganisms to exert their antimicrobial effect. Although we hypothesize there will be no significant difference in the antimicrobial efficacy of conventional irrigants, surfactants, and MTAD. The aim of this study was to evaluate the antimicrobial efficacy of endodontic irrigants and their surfactant regimens on VRE by direct contact assay. This in vitro study was performed in the Central Research laboratory, A. B Shetty Memorial Institute of Dental Sciences, NITTE University. E. faecalis (VRE) ATCC 51299 (Himedia) was used in the study. Bacteria were subcultured from the stock culture. The suspension culture of the test microorganism was prepared in Brain Heart Infusion broth. Brain heart infusion broth was inoculated with E. faecals and incubated for 6–7 h to get a mean optical density of 0.5 McFarland constant; equivalent to 1.5 × 108 CFU/ml (negative control). Then, 1 ml of each suspension culture was transferred to the required number of sterile screw cap tubes (HIMEDIA). All procedures were performed using sterilized instruments and materials. About 5% NaOCl (Prevest Denpro Limited), 5% CHX (Sigma), 5% IKI was prepared by dissolving 5 g of iodine (Merck) and 10 g of potassium iodide (Himedia) in distilled water. Concentrations 1%, 2%, 2.5%, and 5% of the irrigants were prepared for the study by serial dilution. Surfactants CTR from Himedia and SDS from Merck were prepared in concentrations ranging from 0.25%–2%. Biopure MTAD (Tulsa, Dentsply) was used as per manufacturer's instructions served as positive control. All prepared irrigants were stored in sterile bottles. 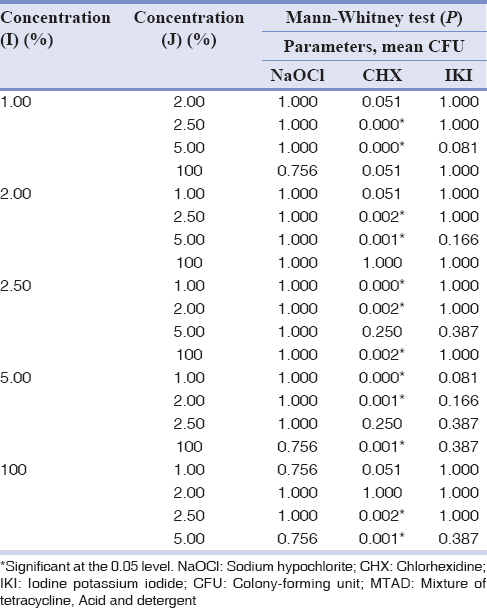 One milliliter of suspension culture of E. faecalis was treated with 20 μl of each of NaOCl, CHX and IKI at varying concentrations of 5%, 2.5%, 2%, and 1%, respectively. The irrigant concentrations consisted of 10 samples each, and the same was done for other primary groups. After adding the irrigants to the microtiter plates, the suspension cultures were added later and mean optical density was recorded in a spectrophotometer (Lisa plus) at 630 nm after 5 min. Simultaneously streaking was performed on already prepared Mueller Hinton agar plates for bacterial colony count. These plates were incubated overnight in an incubator at 37°C. The same was repeated for surfactant group CTR and SDS (0.25%–2%), combination regimens, and Biopure MTAD (control). The number of CFU (colony-forming unit) per ml of culture was determined. The effect of each test agent on microbes was determined by calculating the percentage kill of viable bacteria with the test agent. The percentage of kill for each test agent was calculated by the formula: 1 − (average CFU [test agent]/average CFU [negative control]) × 100. Statistical analysis was done by means of a one way ANOVA and Mann–Whitney U-test. In the primary irrigants, only 5% and 2.5% CHX were significant (P < 0.05) in eliminating E. faecalis with MTAD (concentration100%) as seen in [Table 1]. 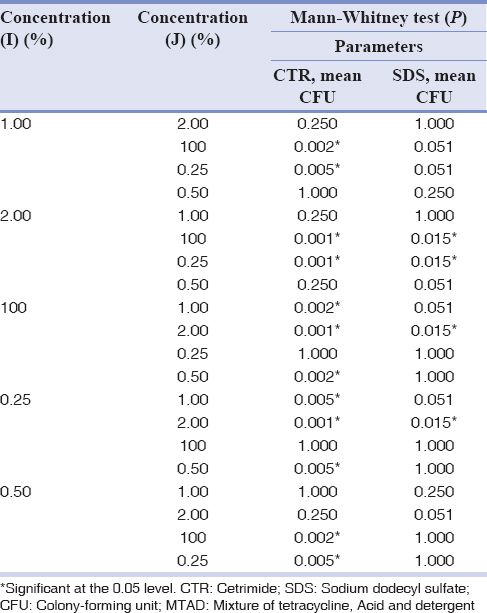 In the surfactant group, all concentrations of CTR (except 0.25%) and 2% SDS were significant (P < 0.05) in killing E. faecalis over MTAD as seen in [Table 2]. The combination regimens (2% CHX +0.5% CTR and 2% CHX +1% SDS) were significant (P < 0.05) and highly effective than MTAD as seen in [Table 3]. With respect to kill percentage in the primary irrigant group, only 5% CHX could achieve 100%; 2.5% CHX, and 5% IKI had 99.90%. About 2% CHX and 2.5% IKI had 99% effective kill percentage. All concentrations of NaOCl were ineffective (90%) as compared to MTAD (95%) as seen in [Figure 1]. In the surfactant group, all concentrations of CTR and SDS were significantly effective and superior than MTAD as seen in [Figure 2]. The combination regimens comprising of 2% CHX +0.5% CTR and 2% CHX +1% SDS achieved an effective kill percentage of 99.9%, respectively, in contrast to 2% CHX (99%) and MTAD (95%) as seen in [Figure 3]. 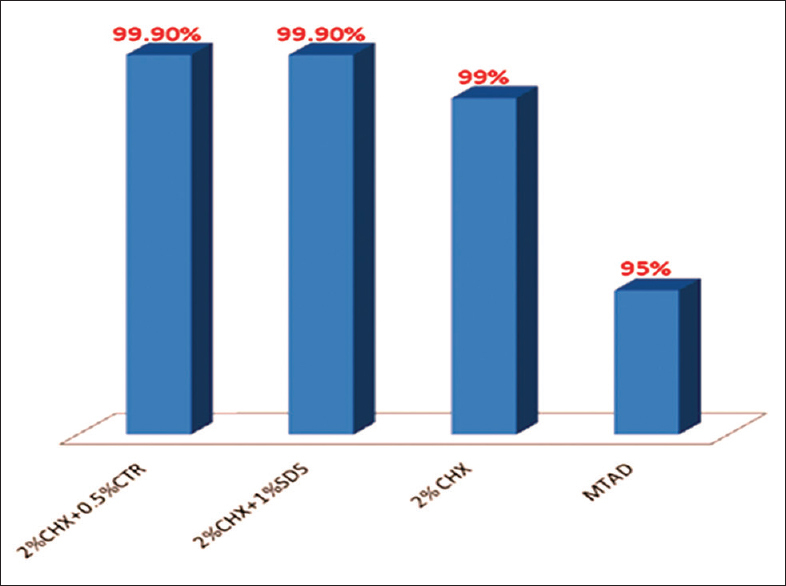 Figure 1: Bar graph showing the kill percentage of primary irrigant groups at different concentrations with MTAD. 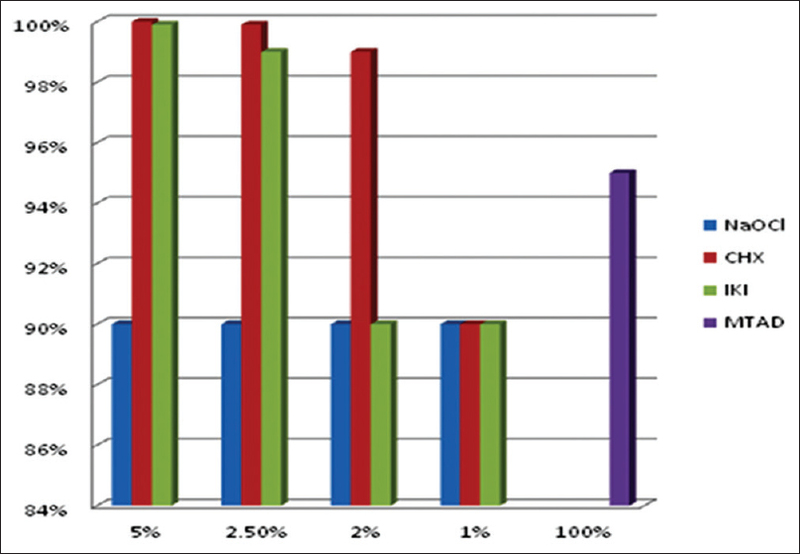 Figure 2: Bar graph depicting the kill percentage of surfactant irrigant group at different concentrations with MTAD. 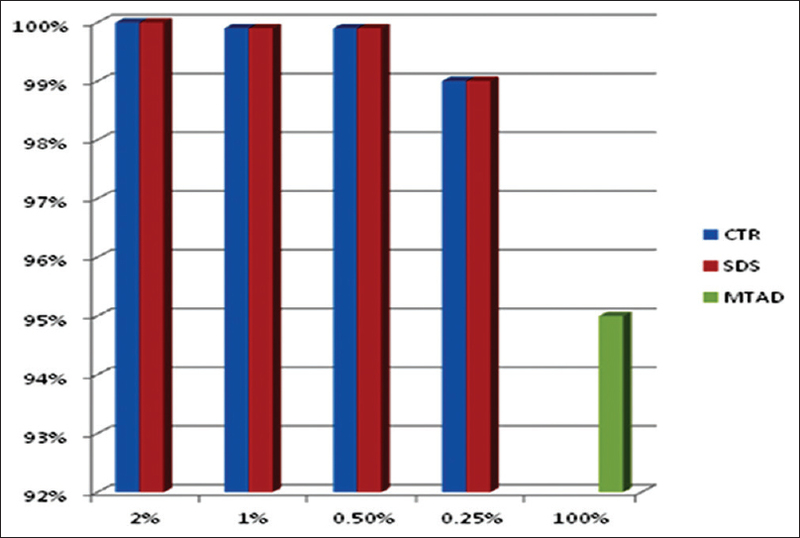 Figure 3: Bar graph displaying the mean effective kill percentage of combination surfactant irrigant regimens with 2% chlorhexidine and MTAD. Although it has been suggested that nonmicrobial factors may be implicated in endodontic treatment failure; current literature suggests that persistent intraradicular or secondary infections are the major causes of failure of both poorly treated and well-treated root canals. Various survival and virulence factors possessed by E. faecalis, possibly explain its high prevalence rates ranging from 24%–77%. Use of good aseptic technique increased apical preparation sizes, and the inclusion of 2% CHX in combination with NaOCl is currently the most effective method to combat E. faecalis within the root canal systems of teeth. Due to the emergence of bacterial resistance to most known antibiotics; their use in endodontics should be restricted as per their requisite. The prevalence of vancomycin-resistant E. faecalis (VRE) was significantly higher in diabetic patients and nonhealing endodontic cases as detected by polymerase chain reaction (PCR). According to Macovei and Zurek enterococcal isolates, E. faecalis (88.2%), E. faecium (6.8%), and Enterococcus casseliflavus (4.9%) accounted for antibiotic resistance. The phenotypic drug resistance to antibiotics was as follows; tetracycline (66.3%), erythromycin (23.8%), streptomycin (11.6%), ciprofloxacin (9.9%), and kanamycin (8.3%). Tetracycline resistance was encoded by conjugative transposon Tn 916 (30.2%) and Tn 916/Tn1545 (34.6%). The tetracycline resistance genes encoded were tet M (65.8%), tet O (1.7%), and tet W (0.8%). Although the presence of VRE was found to vary (0%–30%) among clinical isolates obtained in India; occurrence of VRE along with high-level aminoglycoside resistance needs for regular detection of vancomycin resistance which will help in preventing establishment and spread of multidrug-resistant Enterococcus species. Mathur et al. characterized vancomycin resistant E. faecalis phenotypes by PCR indicated; 115 isolates (26%) high level resistance to aminoglycoside, 293 (66%) to ampicillin, 391 (88%) to ciprofloxacin, 377 (85%) to erythromycin, and 5 (1%) to vancomycin (4 had van A phenotype, and 1 had van B phenotype). We employed quality control strain E. faecalis ATCC 51299 (vanB positive – low-level vancomycin resistant) to evaluate its susceptibility to endodontic irrigants. MTAD was chosen as it contains doxycycline which potentiates for its antibacterial action. Surfactants CTR and SDS were experimental irrigants chosen to evaluate their antibacterial activity. Vianna et al. reported that the time required for 1% and 2% CHX liquid to eliminate all microorganisms was the same required for 5.25% NaOCl. Estrela et al. reported 1% NaOCl was effective on all microorganisms; however, 2% CHX was ineffective. In our study, we found NaOCl was ineffective and could not eliminate VRE even after a contact of 5 min. Radcliffe et al. and Retamozo et al. also found higher concentrations of NaOCl and longer exposure times are required to eliminate E. faecalis. On the contrary, Sassone et al. reported that 1% and 5% NaOCl were effective in eliminating E. faecalis immediately and even after 5, 15, and 30 min interval. In the CHX group, both 2.5% and 5% were highly effective against VRE. The possible explanation for this finding could be related to the nature of CHX liquid that mixes well with the bacterial suspension, thus immediately exerting its bacterial action. CHX is a cationic bis-guanide, positively charged hydrophobic and lipophilic molecule that interacts with phospholipids and lipopolysaccharides (LPS) on the cell membrane of bacteria and enters the cell through active or passive transport. At a higher concentration of 2%, it is bactericidal to bacteria resulting in precipitation of the cytoplasmic contents, which results in cell death. Although 2.5% IKI and 5% IKI were effective in the elimination of VRE, lower concentrations proved to be ineffective. 2% IKI was most effective and required a contact time of 15 min to achieve total elimination in a bovine tooth model; while 10% IKI required 30 min in a planktonic model. Higher concentrations requirement, greater contact time, and delayed availability of free iodine in the aqueous medium account for the poor antibacterial effect. IKI due to its staining ability has limited application in endodontics. Handal et al. reported that Gram-positive microorganisms are more susceptible to lower concentrations of tetracycline (doxycycline in MTAD) than Gram-negative ones. Fujii et al. stated the efficacy of doxycycline in endodontic application may be questionable as Gram-negative species dominate established infections. Mohammadi proposed that the antibacterial effect of MTAD is attributed largely to doxycycline, a primary component that is included to inhibit bacteria. However, resistance to doxycycline (tetracycline isomer) is not uncommon among the bacteria isolated from root canals, and the antibiotic has a narrow spectrum. The combination surfactant regimen of 0.5% CTR and 1% SDS with 2% CHX was chosen based on experimental data and previous results obtained. Both combinations (0.5% CTR +2% CHX) and (1% SDS +2% CHX) had an effective kill of 99.90% as compared to 2% CHX (99%) and MTAD (95%). The possible explanation could be due to surfactants intrinsic antimicrobial activity, lower surface tension, and organic solvent ability that could account for its synergism with CHX. Surfactants CTR and SDS showed promising antibacterial activity even at lower concentrations. The cationic environment of the CTR molecule encourages linking with anionic compound at the bacterial surface and is capable of altering the cytoplasmic membrane integrity. Inactivation of the enzymes of cytoplasmic membrane results in protein denaturation and cell death. CTR is noncytotoxic and has been used as endodontic irrigant. SDS is an anionic alkyl sulfate; has the properties of low-surface tension, can solubilize proteins, increases LPS disaggregation, and inhibits bacterial coaggreagation; which could account for its antimicrobial activity. The results of our study were in accordance with Jungbluth et al., who stated chlor-xtra (6% NaOCl + surface modifiers) did not result in greater antimicrobial activity or soft-tissue dissolution by the addition of surfactants. IKI with surfactant combinations yielded a lesser antimicrobial activity as compared with IKI alone. This could be due to interaction of IKI with the organic surfactants limiting its antimicrobial effect. Giardino et al. stated that cetrexedin (0.2% CTR +0.2% CHX) has the lowest surface tension value; thus increasing the intimate contact of irrigant solution with the dentinal walls, thus permitting deeper penetration of the irrigant. Baca et al. stated that 2% CHX +0.2% CTR would be an effective alternative as final irrigation regimen given its antimicrobial action over time. The results of our study were not in accordance with Portenier et al., who compared the antimicrobial activity of MTAD to that of CHX digluconate and found MTAD and CHX were equally effective in killing E. faecalis. The presence of dentine or bovine serum albumin delayed killing by both medicaments. Estrela found 2% NaOCl could eliminate most microorganisms individually and in mixed composition while 2% CHX failed even after an initial contact time after 5 min by direct contact assay. MTAD as per manufacturer's instructions requires 1.3% NaOCl to be employed initially followed by a final rinse of MTAD for 5 min. NaOCl and MTAD have failed individually to achieve complete elimination thus raising concerns about this regimen in the current clinical scenario., Our experimental data are of clinical significance and suggests the use of surfactants 0.5% CTR or 1% SDS with 2% CHX, contribute to the organic solvent property (CHX lacks), and potentiate the substantive antimicrobial activity of CHX. Our study utilized the quality control strain of VRE to find an alternative to MTAD. The combination regimens proved to be effective over MTAD. In the challenging field of endodontics, the use of clinical strain of VRE and biofilms will enable us to arrive at a concrete picture of this experimental surfactant regimen. Vivacqua-Gomes N, Gurgel-Filho ED, Gomes BP, Ferraz CC, Zaia AA, Souza-Filho FJ, et al. Recovery of Enterococcus faecalis after single- or multiple-visit root canal treatments carried out in infected teeth ex vivo. Int Endod J 2005;38:697-704. Portenier I, Waltimo TM, Haapasalo M. Enterococcus faecalis – The root canal survivor and star in post-treatment disease. Endod Top 2003;6:13559. Jungermann GB, Burns K, Nandakumar R, Tolba M, Venezia RA, Fouad AF, et al. Antibiotic resistance in primary and persistent endodontic infections. J Endod 2011;37:1337-44. Lins RX, de Oliveira Andrade A, Hirata Junior R, Wilson MJ, Lewis MA, Williams DW, et al. Antimicrobial resistance and virulence traits of Enterococcus faecalis from primary endodontic infections. J Dent 2013;41:779-86. Liu H, Wei X, Ling J, Wang W, Huang X. Biofilm formation capability of Enterococcus faecalis cells in starvation phase and its susceptibility to sodium hypochlorite. J Endod 2010;36:630-5. Kandaswamy D, Venkadesh B. Root canal irrigants. J Conserv Dent 2010;13;256-62. Kamberi B, Bajrami D, Stavileci M, Omeragiq S, Dragidella F, Koçani F, et al. The antibacterial efficacy of Biopure MTAD in root canal contaminated with Enterococcus faecalis. ISRN Dent 2012;2012:390526. Kho P, Baumgartner JC. A comparison of the antimicrobial efficacy of NaOCl/Biopure MTAD versus NaOCl/EDTA against Enterococcus faecalis. J Endod 2006;32:652-5. Rossi-Fedele G, Roberts AP. A preliminary study investigating the survival of tetracycline resistant Enterococcus faecalis after root canal irrigation with high concentrations of tetracycline. Int Endod J 2007;40:772-7. Hotchkiss RD. The nature of the bactericidal action of surface active agents. Am N Acad Sci 1946;46:479-2. Sedgley CM, Lennan SL, Clewell DB. Prevalence, phenotype and genotype of oral enterococci. Oral Microbiol Immunol 2004;19:95-101. Siqueira JF Jr. Endodontic infections: Concepts, paradigms, and perspectives. Oral Surg Oral Med Oral Pathol Oral Radiol Endod 2002;94:281-93. Fouad AF, Zerella J, Barry J, Spångberg LS. Molecular detection of Enterococcus species in root canals of therapy-resistant endodontic infections. Oral Surg Oral Med Oral Pathol Oral Radiol Endod 2005;99:112-8. Macovei L, Zurek L. Ecology of antibiotic resistance genes: Characterization of enterococci from houseflies collected in food settings. Appl Environ Microbiol 2006;72:4028-35. Fernandes SC, Dhanashree B. Drug resistance & virulence determinants in clinical isolates of Enterococcus species. Indian J Med Res 2013;137:981-5. Swenson JM, Clark NC, Sahm DF, Ferraro MJ, Doern G, Hindler J, et al. Molecular characterization and multilaboratory evaluation of Enterococcus faecalis ATCC 51299 for quality control of screening tests for vancomycin and high-level aminoglycoside resistance in Enterococci. J Clin Microbiol 1995;33:3019-21. Vianna ME, Gomes BP, Berber VB, Zaia AA, Ferraz CC, de Souza-Filho FJ, et al. In vitro evaluation of the antimicrobial activity of chlorhexidine and sodium hypochlorite. Oral Surg Oral Med Oral Pathol Oral Radiol Endod 2004;97:79-84. Estrela CR, Estrela C, Reis C, Bammann LL, Pécora JD. Control of microorganisms in vitro by endodontic irrigants. Braz Dent J 2003;14:187-92. Radcliffe CE, Potouridou L, Qureshi R, Habahbeh N, Qualtrough A, Worthington H, et al. Antimicrobial activity of varying concentrations of sodium hypochlorite on the endodontic microorganisms Actinomyces israelii, A. naeslundii, Candida albicans and Enterococcus faecalis. Int Endod J 2004;37:438-46. Sassone LM, Fidel RA, Fidel SR, Dias M, Hirata RJ. Antimicrobial activity of different concentrations of NaOCl and chlorhexidine using a contact test. Braz Dent J 2003;14:99-102. Athanassiadis B, Abbott PV, Walsh LJ. The use of calcium hydroxide, antibiotics and biocides as antimicrobial medicaments in endodontics. Aust Dent J 2007;52:S64-82. Handal T, Caugant DA, Olsen I, Sunde PT. Bacterial diversity in persistent periapical lesions on root-filled teeth. J Oral Microbiol 2009;5:1-7. Fujii R, Saito Y, Tokura Y, Nakagawa KI, Okuda K, Ishihara K, et al. Characterization of bacterial flora in persistent apical periodontitis lesions. Oral Microbiol Immunol 2009;24:502-5. Mohammadi Z. An update on the antibiotic-based root canal irrigation solutions. Iran Endod J 2008;3:1-7. Manikandan R, Hegde MN, Shetty V, Kumari S. Antimicrobial efficacy of endodontic irrigants and combination surfactant regimens on Enterococcus faecalis. An In Vitro microbiological study. Int J Curr Adv Res 2017;6:3740-6. Newton BA. The mechanism of the bactericidal action of surface active compounds: A Summary. J Appl Bacteriol 1960;23:345-49. Estrela C, Sousa-Neto MD, Alves DR, Alencar AH, Santos TO, Pécora JD, et al. A preliminary study of the antibacterial potential of cetylpyridinium chloride in root canals infected by E. faecalis. Braz Dent J 2012;23:645-53. Piret J, Lamontagne J, Bestman-Smith J, Roy S, Gourde P, Désormeaux A, et al. In vitro and in vivo evaluations of sodium lauryl sulfate and dextran sulfate as microbicides against herpes simplex and human immunodeficiency viruses. J Clin Microbiol 2000;38:110-9. Jungbluth H, Marending M, De-Deus G, Sener B, Zehnder M. Stabilizing sodium hypochlorite at high pH: Effects on soft tissue and dentin. J Endod 2011;37:693-6. Baker NE, Liewehr FR, Buxton TB, Joyce AP. Antibacterial efficacy of calcium hydroxide, iodine potassium iodide, betadine, and betadine scrub with and without surfactant against E faecalis in vitro. Oral Surg Oral Med Oral Pathol Oral Radiol Endod 2004;98:359-64. Baca P, Mendoza-Llamas ML, Arias-Moliz MT, González-Rodríguez MP, Ferrer-Luque CM. Residual effectiveness of final irrigation regimens on Enterococcus faecalis-infected root canals. J Endod 2011;37:1121-3. Portenier I, Waltimo T, Ørstavik D, Haapasalo M. Killing of Enterococcus faecalis by MTAD and chlorhexidine digluconate with or without cetrimide in the presence or absence of dentine powder or BSA. J Endod 2006;32:138-41. Estrela C, Ribeiro RG, Estrela CR, Pécora JD, Sousa-Neto MD. Antimicrobial effect of 2% sodium hypochlorite and 2% chlorhexidine tested by different methods. Braz Dent J 2003;14:58-62. Newberry BM, Shabahang S, Johnson N, Aprecio RM, Torabinejad M. The antimicrobial effect of Biopure MTAD on eight strains of Enterococcus faecalis: An in vitro investigation. J Endod 2007;33:1352-4. Mohammadi Z, Abbott PV. Antimicrobial substantivity of root canal irrigants and medicaments: A review. Aust Endod J 2009;35:131-9.